Pours a reddish-brown color with a nice thick head. The nose is predominately of hops, malt, and oak. It has pretty nice aroma. The taste is similar but it has a much larger earthy-wood flavor to it and is very sweet. Hops are very present and the carbonation fits perfectly with this beer. Good stuff. In a tulip glass this beer was a dark red/brown color with a rim of tan head. Sweet malt aroma, as well as a bit of flowery odor. Mostly sweet malt taste, some cherry, and a little bit of piney hops. Dry mouthfeel. Not bad, but I was expecting more. Maybe try again. Pours hazy red-mahogany with a slight head that quickly becomes a thin ring. Aroma is sticky sweet caramel malt and toffee sweetness meets earthy hop and brandy soaked dark fruit. Taste is bready caramel malt and brown sugar, with a drying oak character. Boozy with a big brandy character that appeared in the nose. A good bit of peaty smokiness. Cherry and plum dark fruit, orange peel and resinous earthy hops adds some complexity. Finishes a little hot. Certainly drinkable, but not outstanding. Overall flavor is not as robust as I had expected. Pours hazed dark copper with a pretty thick head that settles to a thin, lasting head. Good retention for the style. The smell is of chocolate and caramel. 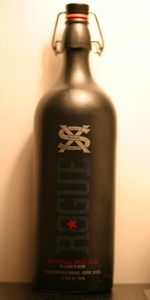 Rogue's signature Pac-man yeast strain is there. Some floral notes mix in. The taste is malty - toffeeish - with a tea-leaf/floral bitterness. Sweetish with a bitterness mixed in. Medium-bodied - alcohol covered pretty well in the taste, though it comes out quickly in the aftertaste. There is a contrasting sweetness and bitterness. Not bad, but not a big fan, esp. considering the price. not too much of a head, just a ring around the edge of the glass. a bit cloudy and burgundy in color like cognac. smelled of raisin, plum and alcohol. tasted a bit sweet and syrupy with hints of raisin and even oak. at the end of each sip there was a stinging bitterness... i couldn't tell if it was from hops or alcohol. i'm sorry to say that it was not very flavorful. it was ok... i was expecting something more floral and hoppier... it was nicely warming. but as for Imperial Reds, it was sub-par. Got it on tap at the Lionheart in Albany on 3-25-09. A: Body is dark amber with a ruby-red tint to it. A small ivory head leaves behind sheets of lace. S: Mainly sweet stuff -- caramel malt, toffee and even some brown sugar. A hint of piney hops in there too, however, with a touch of citrus fruit. T: Follows the nose -- caramel malt, toffee, baked bread and an unidentified spice character. Hops add some citrus and pine. Pine finish balances the sweet malt profile a bit. M: Heavy in weight, slightly slick and oily in feel. D: I like this style, so I did pretty well with it. But I think the heft and sweetness will lead many to go slow with this one. 7 oz nip bottle without a freshness date. Pours an opaque brown color with a small tan foam, even with an aggressive pour. Pretty good retention and decent lace. Rubs me a bit raw that they charge 3.99 for one of these small bottles, seems a bit ridiculous - the equivalent of 12.54 for a bomber. Although that is about the same as the 750 ceramic bottles they put out. Nose is balanced toasty chocolate with an orange peel hoppy aspect and a touch of tobacco. Pacman yeast makes itself known in the smell, which is surprisingly faint for a 9% brew. Taste is smooth and well-rounded. Malts and hops blend harmoniously into a continuous spectrum of flavors on the palate, ranging from sweet to doughy to increasingly bitter. The mouthfeel is soft, but a tad thin. As much as I wanted to diss this brew due to the price, it is a pretty tasty ale. Poured from the lovely and typical XS line bottle - a heavy stonework 750mL with a cap and flip-top. Popped with a good hiss but no fireworks, slid into my tulip with zero excitement and only a layer of head like fog rolling across a field. Settles to a solid ring around the glass's edge with spidery lines across the middle. Dark cherry-red body with a fine, fine haze of particles. What head you can conjure with a swirl (which is surprisingly a lot, considering how much it started with) is rather tan. Smell is banannas and caramel - Banannas Foster, maybe? Malt structure is complex to this nose with a full spectrum of sweet, light notes, savoury caramel notes, and tight chocolate hints now and then. Booze is apparant and is the vehicle for the bananna along with a nice blood-orange tinged hop scent. Warm tones of fresh oak and leather abound. Taste comes in many waves. At first things are much more mellow than expected with bready, funky yeast hiding under a really open palate. Then things sweeten back up and the booze hits you, bringing some spice and more citrus - peel this time. Finally the alphas grab hold and bring you to an almost herbal and taste that compliments the finishing chocolate. Mouthfeel is heavy by any standard, but the brief feeling of lightness at the beginning of every sip really keeps it going down smoothly. Carbonation is right where it ought to be. Coats the lips, but only for a moment. This beer is truth in advertising - imagine a really basic red ale, then double all the characteristics and make the ingredients twice the quality. It'd be unimaginative if anyone else had done it first, but precedent aside this one stands on it's own. Highly recommended as a continued intro to real beer for the initiate when weird, spicy belgians aren't an option and the IIPAs are getting a bit overwhelming. A : Pours a nice red hue with lots of head. T : It's well balanced with strong malts and some hop bitterness on the backend. However, the alcohol really shines through on this one. It would be better if that was mellowed out. A- Ceramic 750ml XS bottle poured into an imperial pint glass. Pours a dark brownish red color with a light tan head with good lacing and retention. S- The aroma is largely comprised of malt and caramel with a hint of dark fruits and a moderate hop presence. A pretty solid aroma, would like to have a bit more of a hop presence in this one but it is solid the way it is. T- The taste like the aroma is big and malty with caramel and dark fruits. The hops come out more in the taste compared to the aroma. This is a pretty nice balanced imperial red, I like it so far! M- The mouthfeel is full bodied with a medium amount of carbonation. D- Overall, Rogue Imperial Red is a winner in my book. The price in the ceramic XS bottles is a little out of my price range for a repeat purchase, but it is a solid beer that is definitely worth a try. A- A deep, red-orange liquid with a touch of haze to it. The creamy bone white head is thin and has good retention. S- Grapefruit rind, vanilla, and alcohol. A little subtle and plain. T- Watermelon, vanilla, alcohol, and grapefruit. Has a bit of a bourbon aspect to it. Complex and intriguing. M- Smooth with a warming alcohol presence at the end. D- The alcohol becomes more apparent as the beer warms. Smooth and complex, but does not live up to the almost $1 per ounce price tag. I'm working my way through the XS series slowly, mainly because of price, but also because they seem to be hit or miss so far. This one looks promising though. A thin, mostly bubbly two finger tan head quickly turns into a fairly thick one finger head, stands still for a while, then fades, leaving a good sheet of lacing around the pint glass. Color is dark amber. The nose involves a good amount of caramel like malts mixed in with some chocolate, some nuttiness, then some hops at the end. Taste big on the caramel with a nice hop bite on the finish. There's not a whole lot else going on, maybe some alcohol in there. It has a medium mouth-feel and medium carbonation. Not my favorite XS so far, but I'm not really for sure what an Imperial Red is supposed to taste like, so I have nothing to judge it against. That being said, it's not bad overall, and I like the good mix of sweetness and bitterness and the fact that they're taking the Red Ale up a notch. On draught at the PDX public house, Imperial Red is hazy amber with with a small eggshell head that leaves decent lace. Smell is pretty hoppy, citrus, and sweet, a bit like a BSPA or saison. Taste is great, very bright, the citrus hops and sweet malts combine in a watermelon jolly flavor that is very tasty if you don't mind candy like beer. Mouthfeel is oily and slick, not to heavy, a nice, softer carbonation. Drinkability is good, I really like this beer, but it's a bit sweet and strong to session with. Still, the alcohol is well hidden, and it's damn tasty. A- Creamy tan head on a cloudy dark brown red body. S- Bunch of toasted malts, grass hops, and that classic red ale aroma. T- Toasted malts, hints of caramel, light roasted notes with some grass hops to help balance it out. Alcohol comes in the back of throat and chest. M- Full body with medium/low carbonation. D- Tastes like a basic red ale with more alcohol, not much more and not much less. A - Pours a dark hazy Amber clour with a one fingered tanned head that dies quick. S - Plenty of yeast, malt and a little hop. T - Up front some small hop, balanced out with some malty notes, a little spice on the finish. M - Medium body and low carbonation. O - Nothing mind blowing but very enjoyable nonetheless. 750ml ceramic swingtop bottle into nonic. Deep mahogany hue; it looks slightly cloudy but it's hard to tell because it's so dark. The head is a little taller than one finger, tan, and slowly settles to a razor thin rim, leaving behind some sticky lacing. A good mix of caramel and some dark candy-like fruit. The dark fruit is in the flavor as well, mixing with some toasty grain. The hops come in toward the end adding a little bit of citrusy bitterness. Full bodied with slightly lower carbonation. The finish is a mix of lingering fruit and some of the citrus hops. This is probably the fruitiest Red Ale I've ever had. It's pretty close to a Scottish/Scotch Ale as well, but much fruitier. This one is a little sweeter than I would like.